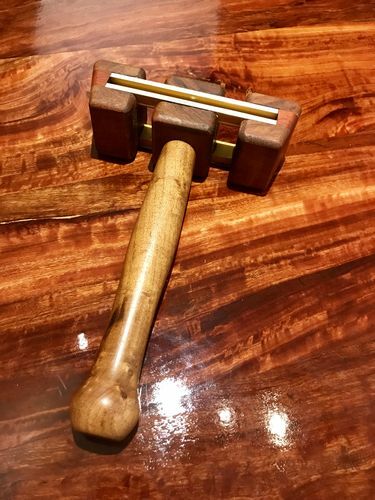 T-track mallet, carbide turning tools, and AZ woods...OH MY! The swap has come to an end. This one was fun as usual. I changed my mind several times for various reasons as to what to make with it being a surprise swap. I settled on some carbide turning tools with some bonuses. I made a full set for Kenny (HokieKen). Square, round, and diamond detail tips too the ends of these. Wood species varies but the center red stripe is blue gum eucalyptus. The lighter wood is citrus of some sort, the brown one is acacia and the other I think is another type of eucalyptus but I’m not positive. The wife doesn’t agree with me and she’s better at species ID than I am. The steel unfortunately was hot rolled since the metal store didn’t have cold rolled in stock. It’s half inch square solid and took a lot of effort to clean up. It’s still not perfect. Then I just dig into the ends enough to put the tips on and drilled a holding bed for the diamond tip. Drilled and tapped the end for screws and the steel work was done. The steel bars are 16” long so they go into the tool about 8”. This gives a lot of heaft to the tool which is nice, especially when roughing something out. The furrels are 1” copper pipe with a pearl epoxy holding the rods in and making the tips by the furrels look nicer than clear would. The tools are over 24” long. Ready to work. If you don’t know, the swap folks have a running joke about T-track. It started last swap with Kenny building his project out of T-track and it stuck through this swap. Thankfully Kenny stepped it up this round and avoided T-track but when I received his name for the swap I just couldn’t help myself. We joked about a T-track mallet in the thread. I would invite you to go read he thread but it’s mostly nonsense and I won’t be able to give you back the time you’ll want back when you’re done reading it. Trust me, it’s in there somewhere. 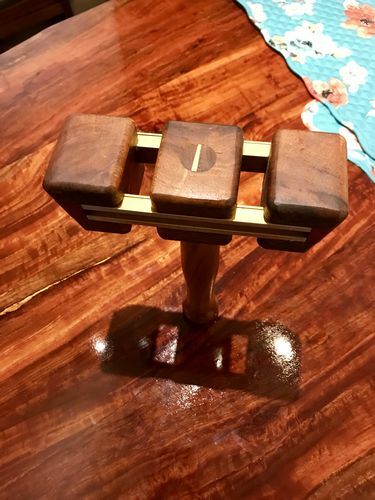 So here is my rendition of a T-track mallet. We had made references to Ironman as well using the incra gold t-track so that’s what I did with pauduk on the ends for the red accent. The rest is made from mesquite. I also included some pretty large pieces of AZ woods because I knew Kenny would enjoy them and put them to good use. I didn’t get a pic but it’s probably around 30-35 pounds worth of wood. STOKED to have been the recipient of this package. 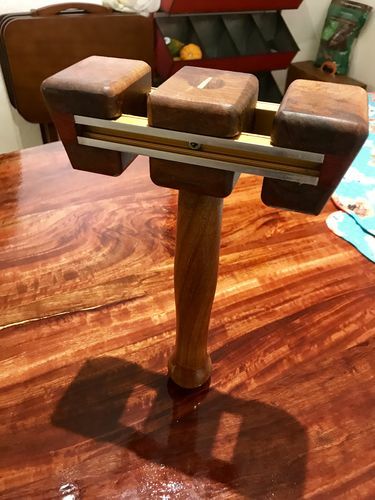 You forgot the pictures of the mallet though! You gotta show that beauty off! I can tell y’all first hand that these tools are first-rate. The turning tools are rock solid with quality materials (even if it did take some extra work with the HR steel) and a super-comfortable handle design with some gorgeous Arizona woods. They will have a long hard life in my shop! It only allows for 6 in the main post so I had to add an additional post. I’m sure there’s a trick to it but I haven’t taken the time to figure it out. Nicely done other Dave! I’m glad you took up the challenge of the t-track mallet. I couldn’t have done it justice. Didn’t you used Tungsten Carbide? Didn t you used Tungsten Carbide? If you look at the pic that shows the ends of the turning tools you’ll see one shaped like a diamond. I drilled a hole behind the embedded portion to put the Back pointed section of that diamond shaped tip so it can’t turn around on you while the tool is being used. I’m honestly not sure if I explained that well enough or made it more confusing. Super job Dave! You and Ken are really making me regret dropping out! I sure would have like to have seen his face when he opened these! We told you Jeff that you would regret it. Everyone always does. Thank you! I would have liked to been there myself. Nicely done other Dave! I m glad you took up the challenge of the t-track mallet. I couldn t have done it justice. I’m sure you would have knocked it out of the park.